Ketu is the descending lunar node and generally referred to as a "shadow" planet. Venus and Rahu are its friends, whereas Moon and Mars are its enemies. Though Ketu is not a Planet it is counted as one of the Navagrahas. The effects of Ketu are somewhat similar to that of Mars. According to Vedic astrology Ketu is the representation of karmic collections both good and bad, spirituality and supernatural influences. 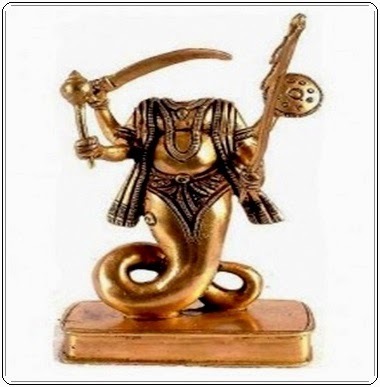 Meaning: I offer my obeisance to the violent and fearsome Ketu who is endowed with the potency of Lord Shiva and having a complexion resembling the flower of a palasa plant, he serves as the head of the stars and planets.